Other top picks had moved up quickly. The question was, did the Cubs' first-round pick Lance Dickson expect to see himself in the majors soon, according to The Chicago Tribune. Dickson didn't, or at least he didn't expect a call up to be handed to him, he told The Tribune. "I feel that I have to earn it. If I do get called up, that's fine with me," Dickson told The Tribune. "But I have no timetable, and it'd be ridiculous for me to make a statement that I should get called this year. That's (the Cubs') job to say when I'm ready. My job is to get people out." As it turned out, less than a week after that early-August 1990 interview, and less than two months after the Cubs selected Dickson 23rd overall, he was in the majors pitching in his first major league game. Nine days after that, the 20-year-old was pitching in his last, arm problems conspiring to shorten his once-promising career. Dickson's career began that June, taken by the Cubs in the first round out of the University of Arizona. At Arizona, Dickson struck out 304 in his three-year career, good for seventh all-time at the school, including 141 in 1990 alone. He also had seven wins and a 3.46 ERA that last year. 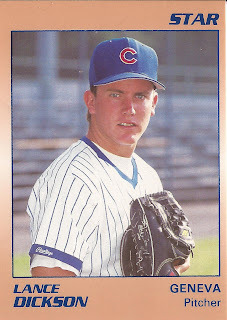 With the Cubs, Dickson started at short-season Geneva. There, he started three games, posting a 0.53 ERA. He then got five starts at single-A Peoria, and three at AA Charlotte. At Charlotte, Dickson's ERA even bested Geneva's, at 0.38. Then he got called up to Chicago and those sterling ERAs were nowhere to be found. In his three major league starts, Dickson gave up 11 earned runs in 13.2 innings of work. Dickson had been called up after an injury in the major league rotation. Despite the outcome, Cubs assistant director of scouting Scott Nelson told The Los Angeles Times the Cubs needed Dickson. "The situation dictated that we give him a crack," Nelson told The Times the next February. "We were in such desperate need and he had been pitching so great. The old rule of thumb in baseball is if a pitcher has a hot hand, it's almost like he can pitch anywhere. So we figured, 'Lets get him up here while he's on a roll.'" Dickson ended up spending that year at AAA Iowa, 18 starts in all. He went 4-4, with a 3.11 ERA. He lost two months to a broken foot, according to The Tribune. Then came 1992. He got just a single start, later undergoing shoulder surgery. Dickson then started his road back in spring 1993, telling The Tribune he hoped to have a healthy season and move back up. "I know when you look at my numbers when I was 20 years old up there, they're not good at all," Dickson told The Tribune that March. "But I want to think that being healthy and stronger and older and all that will help. I know it will." Dickson ended up getting 14 starts that year, between high-A Daytona, AA Orlando and AAA Iowa. Overall, he had a 4.08 ERA. Dickson, though, only had six outings left in his career. He got four in 1994 at AAA Iowa, then two final outings in 1995 in the rookie Gulf Coast League, ending his career.